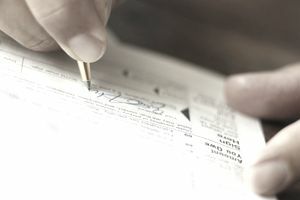 Form 1099 refers to a whole family of tax documents, and each type of 1099 reports various types of income that a taxpayer might receive during the year. Each is related to a specific type of income ranging from payments received by an independent contractor to interest received from investments, and they're all subject to somewhat different rules. Here's a breakdown of Forms 1099-A and 1099-B and what you should do with each of them come tax time. Form 1099-A is for the "Acquisition or Abandonment of Secured Property." Homeowners who have been foreclosed upon might be surprised to find one of these turn up in their mailboxes at year's end. It means that a loan you took out was secured by tangible or real property. You no longer have the property, either because the lender took it back or because you walked away from the obligation, such as by offering a deed in lieu of foreclosure. Either way, the Internal Revenue Code takes the position that the associated unpaid loan represents income to you. You accepted money under the terms of the loan contract and you're keeping it—you're not paying it back. The Internal Revenue Service doesn't care what you did with the money or that you no longer have the enjoyment of the property...thus you'll receive Form 1099-A. The good news here is that the Mortgage Debt Relief Act was extended through tax year 2018 so for the time being, at least, you don't have to include the amount of your unpaid loan balance as income on your tax return. But it can be considered capital gains and therefore be subject to capital gains tax. You can calculate whether this will be the case by using the information included on your Form 1099-A to complete Schedule D if this was your personal property or Form 4797 if it was business property. Reports the abandonment of property that was secured by a loan. Report this data either on Form 4797 or Form 8949 with the net capital gain or loss carried over to Schedule D and Form 1040. Banks, financial institutions, and businesses who acquire property in full or partial satisfaction of a debt secured by that property must issue Form 1099-A to the borrower taxpayer and forward a copy to the Internal Revenue Service. Borrowers who defaulted on their loans during the tax year and who gave up or relinquished the property that was securing the debt in exchange for full or partial satisfaction of the loan. This 1099 represents "forgiven" debt. Penalties increase as more and more time passes after the deadlines. This form also deals with capital gains tax. It includes information about transactions of property or securities that were handled by a broker. You would use this information to complete Schedule D as well, and possibly Form 8949, too. Form 8949 details "Sales and Other Dispositions of Capital Assets." Form 1099-B will tell you whether your gain—or loss—was short-term or long-term. It can be an important distinction because short-term gains are taxed like ordinary income while long-term gains are taxed at more favorable rates. Basically, if you owned a stock for less than a year and made money on it, it's a short-term gain. Not all brokerages will issue multiple 1099s for investments, some for interest, some for dividends, and Forms 1099-B as well. They might include all this information on a "Composite 1099 Form." These are sometimes lacking certain critical information so if you find yourself in this position, you might want to ask a tax professional for help. Investors in stocks, bonds, mutual funds, and other types of securities.